I'm not a fan of rain, and especially icy rain which we had over here in Jersey yesterday. I had to do a little improvising for this shoot. I decided to brighten up my rainy day with a little pink, which always makes everyone happy. At least it does for me. The temps were finally a little decent so I was able to leave the scarf and gloves behind this time. I mixed this cute pink skater skirt with a black and gray color scheme. I've worn this skirt before in a summer post (here) and I love how I turned it into more of a winter look now. I love to mix my wardrobe with certain pieces that can be worn in any season. I kept the look simple with some black booties and tights and my favorite little tweed and faux leather jacket. Oh, and thanks hubby for letting me borrow your sweatshirt! I love sneaking into his Kloset once in a while. This is even more true when I want a real comfy loose fit like I did on this rainy day. 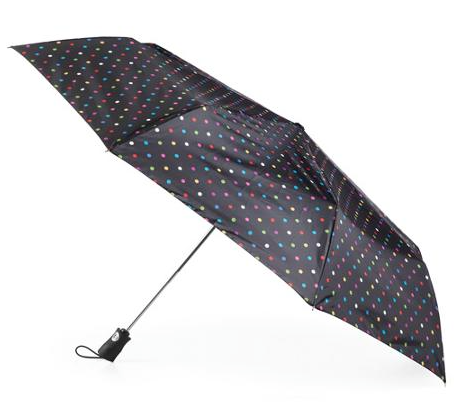 Btw, how cute is this polka dot umbrella...ella...ella?! I love umbrellas by Totes; they have the cutest designs. Sadly I always lose my umbrellas lol. Hope you guys enjoyed this rainy look. I always love are Your looks always something I'd wear.